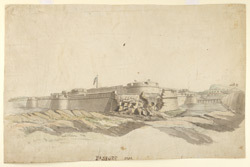 Water-colour with pen and ink of the fort of Hosur, 1792, from the south-west with breached wall and Union flag flying by James Hunter (d. 1792). Inscribed on the reverse is: 'Oossore from reconnoitre 1792' and incorrectly below the drawing: 'Passore 1792.' See also two other views of the fort by Harraden after Hunter, plates 30 and 31, in 'Picturesque Scenery in the Kingdom of Mysore', published by Edward Orme in 1805. The incorrect inscription is a later addition and there is some overdrawing in ink, possibly by the same hand. The fort is said to have been built for Tipu Sultan by a British engineer named Hamilton, who was one of the prisoners beheaded by Tipu in 1791 on the approach of Cornwallis's army, and certainly some of the fortifications seen in the drawing are in a European rather than an Indian style. It was abandoned to the British under Major Gowdie in July 1791 and returned to Tipu after the treaty of 1792. The fort occupied a well chosen defensive site, with natural glacis on two sides, and was a massive structure with outer ramparts over 300 yards long. The southern rampart was protected by the Rama Nayakkan tank, from which the moat could be flooded. Colonel James Welsh wrote in his 'Military reminiscences,' published in 1830, 'This fort is a perfect ruin, but the fragments record its former importance; it had two entire walls of solid masonry, one within the other, and a stone counterscarp and wet ditch with two large out-works in front of the two gateways. The outer wall had many bomb-proof apartments below the ramparts, and there was a capital magazine underground; besides all this it had a square citadel in the centre, where Tipu's garrison made their last stand.' (Vol.1, p.309).